U.S. Official: Afghanistan Could Become 'Narco-Criminal State' : The Two-Way Despite a $7 billion effort to rid the country of opium production, more land than ever before is being used for the illicit trade, says John Sopko, the special inspector general for Afghanistan reconstruction. Soldiers in the Afghan National Army's 6th Kandak (battalion), 3rd company, search a local farmer's poppy field during a joint patrol with U.S. forces in Kandahar province in March of last year. Despite a $7 billion effort to eradicate opium production in Afghanistan, poppy cultivation there is at its highest level since the U.S. invasion more than a decade ago, sparking corruption, criminal gangs and providing the insurgency with hard cash, says John Sopko, the special inspector general for Afghanistan reconstruction. In testimony before the Senate Caucus on International Narcotics Control, he warns Wednesday that Afghanistan could degenerate into a narco-criminal state. "The situation in Afghanistan is dire with little prospect for improvement in 2014 or beyond," Sopko says. 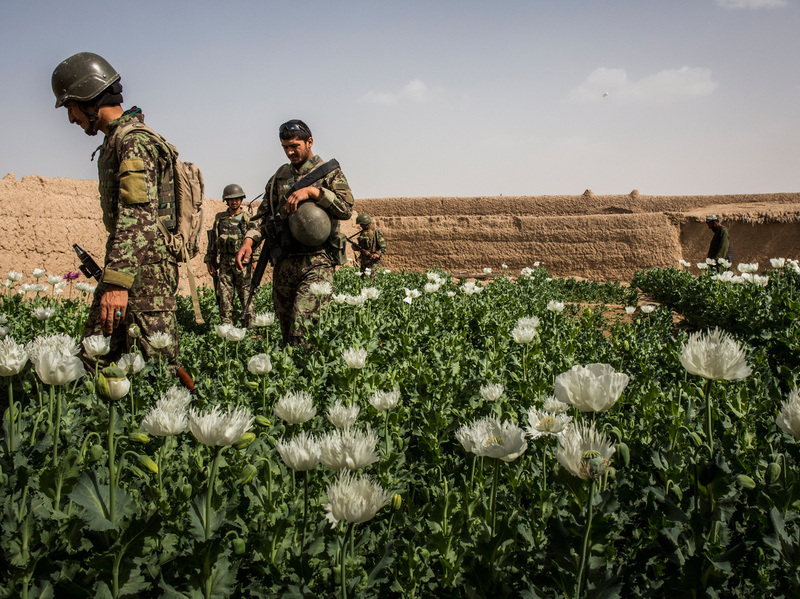 "Afghan farmers are growing more opium poppies today than at any time in their modern history." His assessment largely mirrors a United Nations report released in November that said about 209,000 hectares (515,000 acres) of land was being used to cultivate poppies last year — with the highest concentration in southern Helmand province. That compares with just 8,000 hectares in 2001 and 74,000 in 2002, when U.S.-led international forces toppled the Taliban. As NPR's Sean Carberry reported from Helmand late last year, many Afghan farmers in the province, who say they have few other options, see poppy cultivation as the lifeblood of an otherwise arid region. "The narcotics trade is poisoning the Afghan financial sector and fueling a growing illicit economy," Sopko says. "This, in turn, is undermining the Afghan state's legitimacy by stoking corruption, nourishing criminal networks and providing significant financial support to the Taliban and other insurgent groups." The value of the heroin produced is worth $3 billion annually, or roughly 15 percent of Afghanistan's gross domestic product. As much as 90 percent of the world's heroin is produced there, and some of it is now reaching the United States and Canada, Sopko says. "It is widely thought that every drug organization supports or works with insurgents in Afghanistan," he says. "I have been told that these same groups are closely linked with corrupt government officials." The special inspector general complains that counternarcotics has been a low priority for both the U.S. and Afghan governments and that robust law enforcement is needed. He says that many U.S. and international donor officials and experts have advised him that "one of the greatest risks facing Afghanistan is that the narcotics traffickers and other criminal networks will expand their influence, filling a power vacuum in the areas where the Afghan government is weak."